Apple takes its place in the pantheon of capitalism. *Nominally, on American stock markets. Don't you just hate it when people add disclaimers to celebrations? Yes, Apple's Monday-night valuation finally surpassed Microsoft's (Nasdaq: MSFT) $616 billion high-water mark, set way back in 1999 at the peak of the dot-com boom. With another iPhone on the way, it seems all but assured that Apple will keep growing, possibly all the way to a trillion-dollar market cap. It wouldn't be the first company to reach that size, at least not on worldwide markets. PetroChina (NYSE: PTR) was briefly worth $1 trillion after going public in Shanghai, but its 55 P/E at the time rates it a bit less of a bargain than Apple is today. Except for ExxonMobil (NYSE: XOM), all of these companies hit their all-time highs during the dot-com bubble, and none have fully recovered. The final height of Apple's all-time peak is anyone's guess. Sources: Barry Ritholtz and BLS inflation calculator. 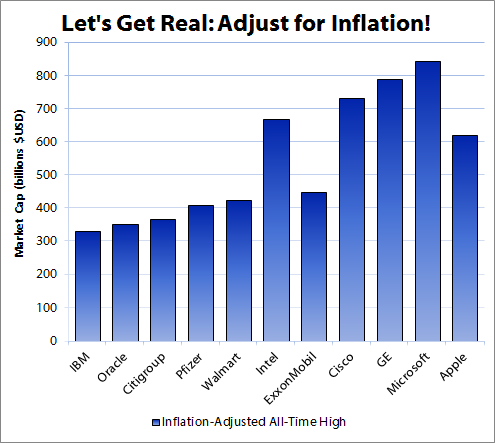 All market caps adjusted for inflation to 2012 dollars. Poor Apple. It's got a couple hundred billion dollars to go before it can surpass Microsoft's inflation-adjusted peak of $843 billion. 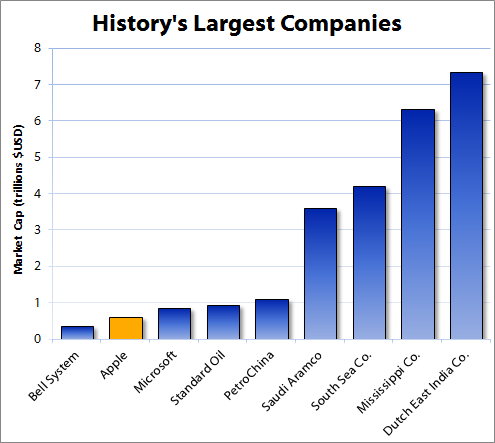 Apple's not even the second- or third-largest company by market cap in American history; it comes in fifth on this list. That doesn't do much to diminish Apple's achievement, since every inflation-adjusted market cap ahead of Apple's came at the height of the dot-com era. The wild run-up of stock prices in those years produced the highest marketwide valuation ever seen. Apple's current market cap is far more sustainable at a 15 P/E than Microsoft's 1999 valuation was with a P/E of 73. Sources: Yahoo! Finance and news reports. 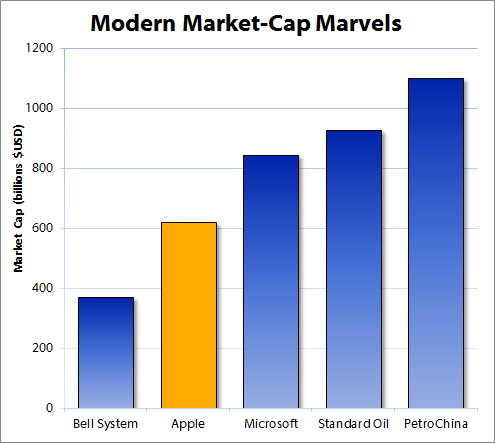 Market caps for Bell System and Standard Oil are a combination of the market caps of modern post-antitrust companies, as reported by Wikipedia. Microsoft and PetroChina are adjusted for inflation. 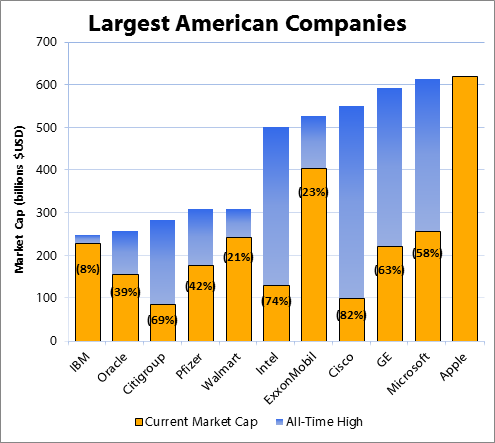 We've covered modern public companies, and Apple may be the best to ever reach such a high market cap. One day, it might be worth more than PetroChina was at its peak, but it's unlikely it'll ever reach higher on the all-time charts. There are some records in the history of capitalism that may never be broken. Standard Oil was massive, but it can't hold a candle to Saudi Aramco. Recent attempts to estimate the state-owned oil-producing colossus have ranged across trillions of dollars, from $2.2 trillion to over $7 trillion. A nice reference point might be $3.6 trillion, calculated by University of Texas finance professor Sheridan Titman. That's fairly conservative, since Saudi Aramco's estimated 260 billion barrels of reserves are worth about $25 trillion at current prices. Things get bigger from here. We've exhausted the store of massive modern companies, but capitalism's distant past is home to some real monsters. During the Age of Sail, "really big" meant something worth millions of pounds sterling, and two companies stood out from the rest -- though not for particularly positive reasons. Twin bubbles formed in 1720 around speculative joint-stock companies that promised to capitalize on trade with the American continents. Between them, the Mississippi and South Sea Companies would grow to be worth a combined 500 million British pounds sterling, coining the terms "millionaire" and "bubble." This was in 1720, when the average person could expect to live fewer than 40 years and might be lucky to make any money at all. The real economic value of the two companies at their peaks would today be in the range of $10 trillion, with the South Sea Company worth $4 trillion and the Mississippi worth $6 trillion. Since neither company ever managed to trade much with the Americas, this resembles nothing so much as the dot-com bubble on a hyper-manic level. To imagine something similar happening in dot-com terms, you'd have to picture the CEO of Webvan raising $10,000 from every single person in the United States, in exchange for exclusive shipping rights to the city of Athens. Not every shipping company was full of false promises, though. The Dutch East India Company was the first company to go public on the world's first stock exchange. It raised enough capital in 1602 to later create a globe-straddling multinational conglomerate, with over 70,000 employees at its peak. That didn't make it immune to irrational exuberance -- its market capitalization would reach 78 million Dutch guilders at the height of Tulipmania, since at least a few investors must have wanted to buy something more stable than the Beanie Babies of the 17th century. That would place its modern-day valuation in the $7.4 trillion range, making the Dutch East India Company the largest company in history. Sources: Sources: Barry Ritholtz, Marc Faber, Richard Dale, Bloomberg, Clem Chambers, Wikipedia, Yahoo! Finance, and Sheridan Titman. Adjusted for inflation. These old records are like baseball's dead-ball era marks. Modern pitchers won't win anywhere near 500 games, and Apple won't be worth a substantial chunk of the global economy. That doesn't make today's 250-game winners less impressive, or Apple's accomplishments less notable. Things have changed, and a look back can help us remember how far we've come.